The Tain Golf Week, sponsored by MacDonald Haulage Contractors, saw Fife-based Ross Moir, a member of the Duke's Club, St Andrews, visited Tain for a fourth year and took part in the men's opening 18 hole open competition in which the Fifer began his stay in the North by winning the scratch Beveridge Cup with a card of two-under-par 68. Moir, pictured right, matched the Tain par for the first nine holes before his round came alive with successive birdies on the tenth and 11th holes. A third birdie followed on the 14th green. He come home in 33 with just one bogey (at the16th) to win by one shot from Inverness's David Joel (34-35). 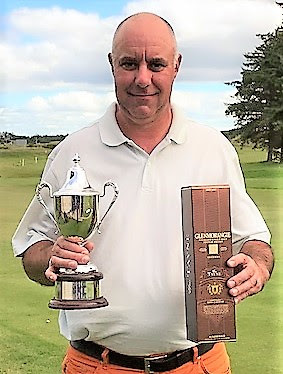 In the same competition, winning their first trophies of the week were Russell Marshall (Tain), the Morrich Trophy for seniors, net 72, off 8, and Robert Mackay (Fortrose and Rosemarkie) who won the Morangie Trophy for best net in Class 1, a 70 off 4. Local Steven Pater took the Gardiner Trophy for lowest net in Class 2, 92 (19) 73, with a better inward half count over clubmate Robert Walker. +The next day scratch winner Moir travelled to Northwest Sutherland and won the Durness Open with a 75 (39-36). When the Tain men's qualifying rounds for the match-play stages on Monday and Tuesday were played club champion Lyle McAlpine led the qualifiers with rounds of 70 and 71. Clubmate Keiran MacKay was second seed with 74 and 68. Also on Monday and Tuesday the ladies had their event for The Flower Shop London House Trophy which was won by Caithness teenager Mollie O'Brien (Reay) with 67 Stableford points, 34 and 33 each day off seven of a handicap. Local Angela Ross won the Hayden Trophy with 66 points and clubmate Ann Ryan finished third with 65 points. Best Monday round was 35 points from Angela Grant (Brora) and on Tuesday Jane Lloyd (Parkstone) 33 points.